Greens Farms Academy's Jack Ramsay (12) goes up to the basket during basketball action against Hamden Hall in Hamden, Conn., on Wednesday Feb. 13, 2019. HAMDEN — When Christian Adams called “glass” on a three-point shot he took from the beyond the arc and it banked in the basket, it was the climax of what was an almost perfect game for Hamden Hall Wednesday night. 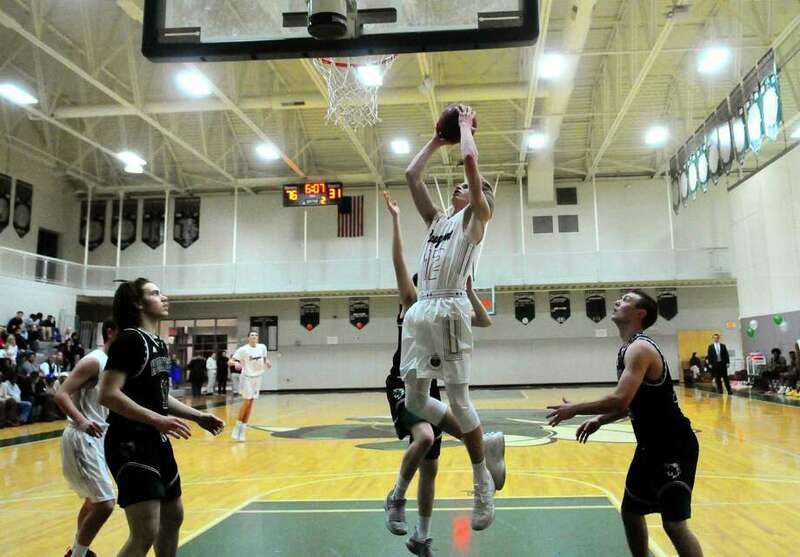 Adams scored a game-high 26 points, including six from beyond the three-point line, as the Hornets ripped Green Farms Academy, 81-50, in a Fairchester Athletic Association boys’ basketball contest at the David Beckerman Athletic Center. Hamden Hall actually trailed early in the game as Greens Farms didn’t turn the ball over much and was able to get through the Hornets defense. But after being down by as much as four, 13-9, and then tied it at 15-15 with 8:47, Hamden Hall totally changed the game. The Hornets took the lead on a traditional three-point play by Tre Breland (12 points) and went on a 26-6 run over the final 7:13 of the first half to take a 41-21 advantage at intermission. While Hamden Hall had five three-pointers during that stretch, it was the Hornet defense that was the difference. The Hornets are usually a zone defensive team that presses. However, Hamden Hall coach Sean Doherty switched to a man-to-man trapping defense that befuddled the Dragons. Adams smiled as he talked about the defensive change. As good as Hamden Hall was in the latter half of the first 16 minutes, the Hornets were even better in the second half. With Adams hitting three treys and Dawson (18 points), Breland and Jackson Benigni (12 points) not missing often, it was almost a perfect second half as they went on a 35-10 tear in the first 9:49 of the second half. Of the 35 points in that spurt, Adams, Breland and Dawson accounted for all but three of them. At that point, Doherty pulled his starters and Greens Farms Academy scored 19 points in the six minutes to make the final score looked closer. With the victory, Hamden Hall clinched no worse than second place in the FAA. The Hornets (11-1 in the FAA and 19-2 overall) will tie for the league regular season title with a win at King Thursday. In that case, a coin flip between Hamden Hall and St. Luke’s will determine the top seed in the FAA postseason tournament. Greens Farms Academy fell to 14-6 with the loss. David Basich led the Dragons with 8 points. Cole Prowitt-Smith had seven points, all of them coming in the first eight minutes of the game. Tim Dawson 3 3 5-6 20, Christian Adams 4 6 0-1 26, Jackson Benigni 3 2 0-1 12, Jahki Pettway 0 1 0-0 3, Chris Cahill 0 1 0-0 3, Ethan Doherty 0 1 2-2 5, Tre Breland 4 0 4-5 12 Totals: 28 11-15 81. T.J. Holloway 2 0 1-1 5, David Basich 2 1 1-1 8, Cole Prowitt-Smith 2 1 0-0 7, Greg Lawrence 2 0 2-4 6, Kobi Agard 1 1 1-3 6, Jack Seegers 0 2 0-0 6, Jack Ramsey 2 0 0-0 4, Jack Brown 2 0 1-2 5, Noah Kanfer 0 1 0-0 3 Totals: 19 6-11 50. 3-pointers: GFA—Seegers 2, Basich, Prowitt-Smith, Agard, Kanfer; HH—Adams 6, Dawson 3, Benigni 2, Pettway, Cahill, Doherty.